On '60 Minutes,' Lesley Stahl strives to delegitimize the presence of Jews in the City of David and cast doubt on an archaeological dig there. 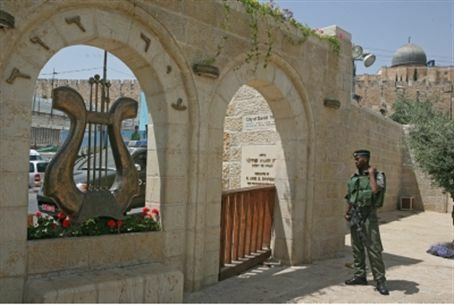 CBS television network anchor Lesley Stahl is up in arms over Jerusalem’s Silwan neighborhood – known to Jews as Shiloach, and home to the City of David archaeological excavations. The reporter from the long-running Sunday evening “60 Minutes” program narrated a segment this week on the City of David, produced by Shachar Bar-On. During the segment, Stahl worked hard to cast aspersions on the validity of the archaeological findings in the City of David excavations and the unity of the city, and to delegitimize the presence of Jewish families in the area. The Jewish families are in houses bought by Jews, many of them Yemenites, before the creation of the State of Israel. Excavations have shown ample proof of the presence of Jewish life in the City of David during Biblical times, including a signet ring bearing the seal of the man named in Kings !! as Jeremiah's scribe. She also bluntly charged Israel with using the archaeological excavations as a political tool to indoctrinate IDF troops. The journalist referred to the “scores and scores of soldiers coming through” the underground tunnel through which King David sneaked into Jerusalem to conquer the city. “There’s an implicit message that because David conquered the city for the Jews back then, Jerusalem belongs to the Jews today,” she observed. ‘Inconvenient Truth’ – Where was Biblical Jerusalem? Stahl went on to describe the mayor’s plan to build a national park in the part of the neighborhood that was never zoned for housing--even during the Jordanian occupation of the area--as it is called the King's Garden in the Bible, a plan that involves demolition of 22 illegally-built Arab homes. The families who built the homes would receive comparable land, to rebuild nearby, although they have no legal claim to the land on which they have built and Jerusalem real estate is very costly.